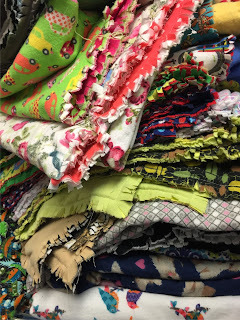 We have a sewing friend who makes blankets for CCSC's clients. She's 96 years old, and her daughters are important to the project: they purchase the materials for their mother, bring them to her so she can make the blankets at home, and then deliver the completed blankets to us. They select fabrics that are whimsical children's patterns or lovely adult prints. It's clear that much love and intention goes into this process. Last month, the daughters delivered 50 blankets, and there's a picture of some of them below. Earlier this week, a woman who came in for food also asked for a blanket, saying in the same breath that she knew we wouldn't have any since it was summer. Yet thanks to our dedicated "home volunteer", we were able to surprise this woman with a beautiful, handmade blanket. Volunteering is about sharing your time and talent for a greater good, and it doesn't have to be done on-site. If you have an idea on how you could help our clients, please contact Volunteer Coordinator Erin Donohue, edonohue@ccschouston.org.